The year before this little jaunt, my family and I had gone ziplining at Whistler Mountain in British Columbia, and we were all pretty much stoked to do it again, except somewhat closer to home. We began doing research on what was in the area, and we heard about Hunter Mountain. 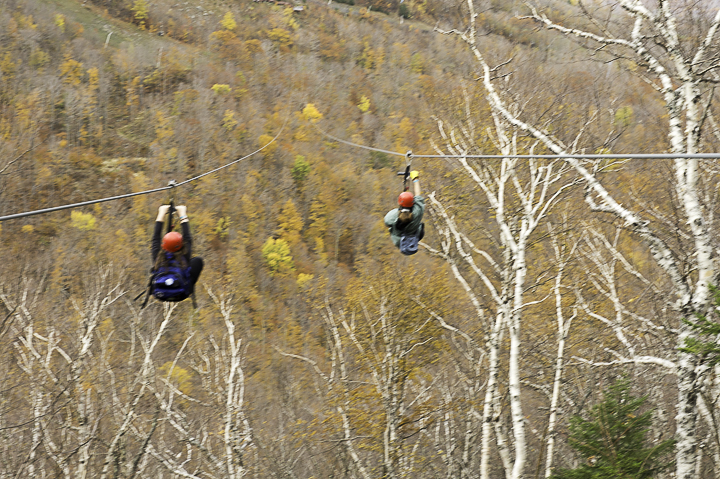 The zipline course at Hunter is run by New York Zipline Adventure Tours; they’ve got a couple of other locations in New York, New Hampshire and Jamaica. There are a couple of different courses up on the mountain: there’s the Mid-Mountain Tour, for those who want adventure but aren’t quite ready for the SkyRider. For those who groove purely on climbing and obstacle courses, there’s also the Adventure Tower. The SkyRider is the big one. Really big. So big that it’s been billed as the longest and highest zipline tour in North America. 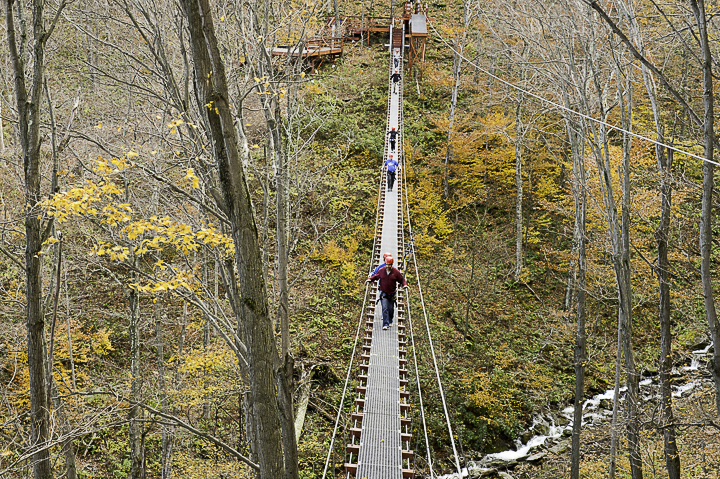 It includes a line that’s 3,000-plus feet long, and 600 feet over the valley between the mountain peaks. Simply put, it’s nae for the squeamish. I remember getting a touch of vertigo the first time I looked at the photos on the website. But my vertigo was outweighed by my zest for adventure (though some might call it just plain foolhardiness). Getting there: We all piled into my car that morning in New Jersey and took the Garden State Parkway up to where it hitched up to the NY State Thruway. Like I said, it was October (less than a few weeks before Hurricane Sandy blew through and trashed the area), so the fall foliage was positively gorgeous. Got off onto Rt. 23A (‘round about Palenville) and headed west toward Tannersville and Hunter. Checked in at the main ski building (Hunter Mountain’s also a big ski resort), filled out the “I-promise-not-to-sue” paperwork and got kitted out with our helmets, harnesses, trolleys and admissions bracelets (they’re color-coded for each zip tour; blue for the SkyRider tour). Then we boarded the bus and rocked our way up to the starting line. Each line on the course is a set of two parallel lines, so two people can take off at once. Unlike the lines at Whistler, where you can just walk off the platform and be off, at Hunter Mountain it’s highly recommended that you take a running start off the platform. Mom and I elected to go first. So there we were, standing up on the platforms, trolleys latched to the lines. You’re soaring. No exaggeration. You’re soaring down the line – at up to 50 mph, according to the guides – and the wind is roaring in your ears. From there, we started working our way down the mountain and deeper into the fall foliage. Unlike the lines we did at Whistler, the lines at Hunter run at a little less of an angle – they’re a touch more horizontal. So you need to build up some momentum to make it all the way across. So after you take your running start, pull your legs up into a cannonball. (This is where it helps if you take yoga.) And then once you start coming into the platform, let your legs drop down so you can slow down. Applied physics, here, people. If you’re going to be doing the SkyRider or any other zip, it’s best if you’re relatively fit. There’s a bit of hiking involved, and some stair climbing. In addition, the trolley (which you carry with you) weighs a fair bit. There’s one line farther down where you don’t come to land on a platform – instead, you come in to hover over a rolling stepladder, and the guides have to unhitch you and help you climb down. There’s a Burma bridge that you have to cross to get to some of the lines. Now, your trolley gets hooked to the bridge cable so you don’t go falling off. It’s a fun challenge to get across it – but I found that crossing the bridge, with all its bouncing around, plus the creek running beneath, was giving me a mild case of the whirlies. My advice: look straight ahead, and take it at a bit of a jog if you have to. It was late afternoon by the time we descended the mountain and took our leave of the group. Stopped for photo ops at the Kaaterskill Falls down the road, backtracked for Mass at the local Catholic church (so we could sleep in the next morning) and had dinner at the Last Chance Antiques and Cheese Café in Tannersville before setting back down the Thruway. My verdict on Hunter Mountain: I’m definitely going back at some point. I’ve since learned that they now offer a nighttime zipline tour (could be a subject for a future blog – stay tuned). About that John Wayne quote, about saddling up when you’re scared. Yeah, you may be a little jittery, but it would be far worse to miss out on the adventure of a lifetime (or at least a weekend).